Overview of metabolic remodeling with immune cell differentiation and activation. 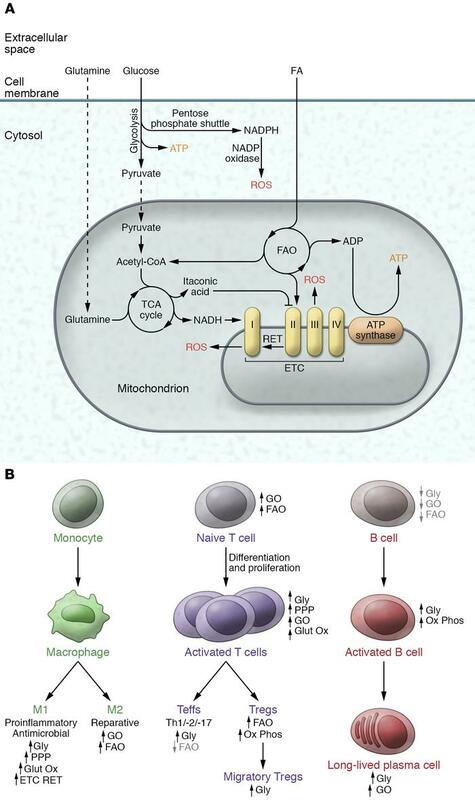 Overview of metabolic remodeling with immune cell differentiation and activation. (A) Major pathways linked to immunometabolism include the generation of ATP from cytosolic glycolysis or from oxidative phosphorylation of pyruvate, fatty acids, and glutamine. Cytosolic NADPH oxidase or mitochondria produce ROS, which can signal, oxidize proteins, or exert antimicrobial effects. The major sites of mitochondrial ROS production linked to immunometabolism are generated at complexes I and III of the ETC. (B) In monocytes, metabolic remodeling is most extensively characterized in the differentiation into the M1 and M2 cell fates. In CD4+ T cells, immunometabolism has been explored at multiple levels of differentiation, proliferation, activation, and migration. B cell immunometabolic control is less well explored; however, metabolic remodeling is important for different B cell fates. FAO, fatty acid oxidation; Glut Ox, glutamine oxidation; Gly, glycolysis; GO, glucose oxidation; PPP, pentose phosphate pathway; RET, reverse electron transport in the electron transfer chain for ROS generation.